← CSC Welcomes Michael J. Musacchio, Jr., M.D. In my medical practice, I see a lot of patients with herniated discs. Many of these patients can be treated with conservative therapies, yet if surgery is needed, there are minimally invasive technologies that can be used. Lumbar herniated discs are common causes of low back pain which radiates down one or both legs. Herniated discs become symptomatic when they compress or impinge upon nerve roots as they exit the spine adjacent to the disc spaces. The pain caused by a herniated disc is typically described as a “burning” or “tingling” pain, which can become quite debilitating and is often made worse by activities such as bending forward or sitting. At worst, the herniated disc may result in actual weakness of the leg or foot. While it may take several weeks, the pain caused by herniated discs will most often resolve on its own with the assistance of pain medication, physical therapy, and occasionally oral steroids. However, in some patients, surgical intervention is indicated, particularly in those with acute weakness. Surgery for lumbar herniated discs has changed dramatically with the introduction of minimally invasive techniques to the spine specialties. The goal of herniated disc removal is to decompress the pinched nerve root causing pain or weakness. Microsurgery offers several advantages to the patient, including smaller incisions, less tissue destruction, minimal post-operative pain, and the ability to be performed on an outpatient basis. Traditionally, surgery for lumbar herniated discs involves an open approach via a longer midline incision. The paraspinal muscles are then stripped away from the posterior spinal elements to expose the boney lamina overlying the disc space. The lamina is then removed to allow the surgeon access to the herniated disc. Post-operative pain usually correlates to the amount of muscle stripping and tissue destruction that occurs. Microdiscectomy employs the use of a tubular retractor system which displaces muscle, thereby minimizing tissue destruction, and, ideally, post-operative pain. 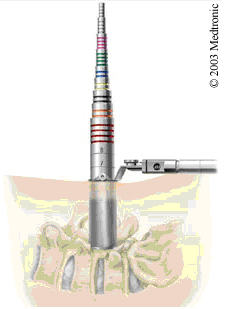 Through a small incision next to the midline, the retractor is placed via a series of dilators. This muscle dilation gently, displaces the muscle fibers. Using a microscope or endoscope, the surgeon has an excellent view of the boney elements, and can safely remove the lamina to gain access to the herniated disc. Lumbar microdiscectomies can be performed safely and on an outpatient basis. The success of microdiscectomies is considered equivalent to that of traditional open discectomies. Microdiscectomies provide the benefits of smaller incisions, less tissue destruction, minimal post-operative pain, and may be performed on an outpatient basis. As with all spinal surgeries, risks of microdiscectomy include, but are not limited to, injury to the nerve root, further neurological damage, bleeding, and infection. All of these complications are rare.